Chikaskia (AO-54) was launched 2 October 1942 by Bethlehem-Sparrows Point Shipyard Inc. Sparrows Point Md. under a Maritime Commission contract; sponsored by Mrs. J. L. Bates; acquired by the Navy 10 January 1943; and commissioned 10 November 1943 Commander L. J. Hasse USNR in command. On 15 December 1943 Chikaskia sailed from Norfolk loaded oil at Aruba and arrived at Pearl Harbor 7 January 1944. She joined Task Force 58 at Majuro 4 February and provided logistic support for the fast carrier force's strikes during the occupation of Kwajalein and on Truk. Between 7 March and 15 September 1944 Chikaskia operated out of Espiritu Santo New Hebrides; Purvis Bay Florida Island; and Manus Admiralties bringing vital at sea replenishment of fuel to the fast carrier task forces and other ships. Departing Manus 18 September 1944 to aid the fast carrier task force engaged in the invasion of the southern Palaus Chikaskia gave a striking illustration of her capabilities by simultaneously refueling Iowa (BB-61) and New Jersey (BB-62) 23 September. Changing her base to Ulithi on 25 October 1944 Chikaskia continued to support the fast carrier units. She was part of the fueling unit that endured the typhoon which struck the 3d Fleet during a fueling rendezvous 18 December weathering the heavy seas to return safely to Ulithi 24 December. She continued to provide logistic support during the operations in the Philippines and the invasions of Iwo Jima and Okinawa until she returned to San Pedro Calif. for overhaul 22 May 1945. Chikaskia returned to Ulithi to support the 3d Fleet from 17 August 1945 until she entered Tokyo Bay 20 September. After a period of shuttle service in support of the operations in China and Korea (8-22 November) she served as station tanker at Sasebo from 29 November 1945 to 31 March 1946. Chikaskia sailed from Sasebo 8 April 1946 bound for Bahrein in the Persian Gulf which she reached 30 April and after loading oil sailed for Kwajelein to participate in Operation "Crossroads " the atomic weapons tests at Bikini. Assigned to the Naval Transportation Service 1 July 1947 Chikaskia continued to operate in the Far East. On 1 October 1949 she was assigned to the Military Sea Transportation Service established that date. 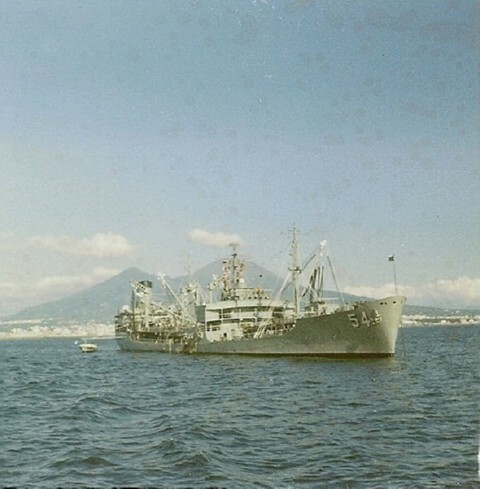 The Chikaskia, for 14 of my 22 months aboard, served as a Military Sea Transport vessel supplying fuel oil to naval bases on both U.S. coasts, the Caribbean and Hawaii. By May of 1953 we had been refitted and trained as a Fleet Oiler assigned for 8 months to the 7th Fleet, Korea. Our reassignment entailed not only the new underway fuelling operations, but also the use of armament ranging from 20 and 40mm to 3 and 5 Inch guns. Then there were the depth charges, minesweeping gear, and the required ammo storage. This, along with the 18,000 barrels of avgas aboard brought on a great awakening among the officers and crew. My anecdotes and photos should bring back memories to others who served aboard AO54. Returned to the Service Force Pacific Fleet 28 February 1953 Chikaskia fueled ships operating in the Korean war between 30 May and 27 July. She continued to operate in the Pacific until June 1955 when she returned to the United States. Chikaskia was placed out of commission in reserve 7 November 1955. Recommissioned 12 December 1956 she was placed in the ready reserve in late 1957 and again joined the permanent Reserve Fleet in December 1958. Chikaskia was recommissioned on 17 December 1960. Chikaskia received six battle stars for World War II service and one star for Korean war service.